One of the prior owners planted this peony – and in the entirely wrong place – nestled under an ash tree with little. The brave little thing clung to life but never thrived. When we lost the ash tree to last fall’s ice storm, we were glad that we had moved it. 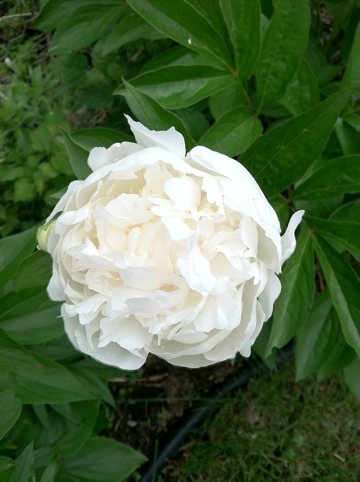 Now it lives in the back of the garden – Peony Lane – and is thriving in the full sun that peonies so much love. 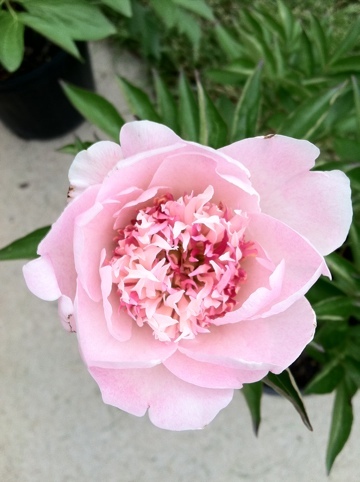 And the bloom opened even more when we cut it and brought it in – with the most heavenly smell. One neighbor said she hadn’t smelled a peony like that since her grandmother’s garden. Lovely, just lovely. One of the two we bought at the show yesterday -the blossom opened overnight.